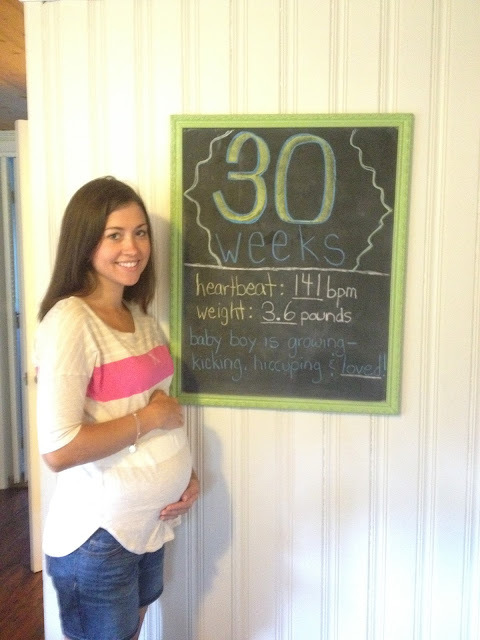 The Life Of Faith: 30 weeks pregnant with our baby boy! 30 weeks pregnant with our baby boy! Health update: I have had a couple more visits with the Perinatologist as well as my OB and prayer is still appreciated for the health of our baby boy. His kidney's are both still dilated, one worse than the other, but how that affects him won't be definite until he is born so the doctor is going to continue monitoring his fluid levels until that point. He also has an Echogenic bowel which could indicate a number of things and we won't know that until he is born either. I am so thankful that neither of these concerns are life threatening and we have a growing and active boy on the way! I can't imagine the uncertainty and anxiety that I would have if it weren't for the fact that I know the one who is in control of all things and who is personally knitting my son together inside of me. God is good and I am learning so much more about his goodness through the ups and downs of this pregnancy. Movement: This week the doctor officially declared this stubborn boy as breech. Ideally he would be making his way in the right direction by now, but he seems to be pretty content bottom side down which is actually much more uncomfortable for me! When he kicks, he kicks down towards my bladder and nerves leading down my legs which is a new sensation for me. He is also cutting off a lot of circulation to my right leg leading to some lovely varicose veins and numbness. Pray with me that he is turned by my next visit in 2 weeks! Morning Sickness: Morning sickness has still been a daily battle for me. Some days I am nauseous all day, and other days aren't as bad! My nausea has been made worse by the heat, unfortunately so we have been spending a bit more time indoors on these 100 degree days! Weight Gain: I have gained around 20 pounds now, which is hard for me to accept personally, but I know that it's healthy for my baby and so I'm glad for that! 20 pounds is what I gained total with my first and it's hard not to compare to that even though every pregnancy is different! I have been consistent with eating healthy and doing Prenatal workouts so I'm hoping it isn't too hard to lose what I've put on once he is here! Clothes: I have a few tops, dresses and elastic waist shorts that aren't maternity that I like to wear, but otherwise I am wearing mostly maternity clothes these days! I also have to wear compression hose or socks most of the time. It has been challenging to try to match that with any summer outfit and not look like a complete dork! Best Moments: Last week, my 2 year old and I took a trip to Georgia for a family reunion that included my siblings as well as Aunts, Uncles, cousins and extended family. It was one of the highlights of my year spending that time with my sisters, brothers and family. We made so many wonderful memories at the beach and just hanging out together! I am so thankful that I was healthy enough to make the trip! My big sister and I are just a month apart in our pregnancies, both with baby boys! Even though we live in different states, I hope our little guys are buddies! Hard moments: The heat! It wasn't bad until this week so I guess I should be grateful! The air conditioning in our vehicle no longer works and it doesn't look like it's going to be something that is worth fixing so anytime I go out to run errands, I am miserable! I am so thankful to have a home with air conditioning, that's for sure! Sleep: I was sleeping well until a few nights ago. Even though I am tired, I can't seem to get comfortable. I guess I need to bring in more pillows! Miss Anything: I miss being able to carry my daughter, but I guess it's good practice for her for when baby gets here! Aversions: Mexican food and anything with raw onion in it. Mood: This week I really started to think about what I need to get done before he is born. I have some shopping and cleaning to do! If only I could buy some energy on Amazon. Other Symptoms: I have had some pretty bad headaches with this pregnancy which could be caused by lack of sleep I'm sure! What Big Sister Thinks: She likes to point out my big belly and has felt brother kicking her several times now which I think is exciting for her! She also makes sure that we include him in our prayer every evening. Several of our close friends have had babies recently which has been great exposure for her! I know it's going to be an adjustment for her still, but I'm hoping that she's a little bit prepared for what is coming, if that's possible! Looking Forward: I am excited to get a hospital bag packed in the next few weeks and get some things ready around the house. There is a possibility that they could induce me as early as 34 weeks if his bowel starts to dilate badly so I need to be ready sooner than later! It has been fun to have photos from my first pregnancy to compare my bump to. 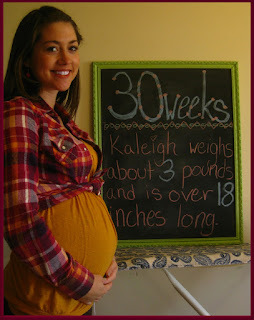 Here is my 30 week photo with my first pregnancy. I definitely am carrying this little guy differently! I'm so excited for you! We have a 2 year old daughter and just welcomed a son on July 1. He instantly stole my heart and I know you'll surely feel the same :) You, your son and your family are on our prayer list. God is developing an amazing testimony through you and your son. I can't wait to hear about the miracles He performs. Thank you Kristy! I appreciate the encouragement and am touched that we are on your prayer list. That really means a lot to me. I can't wait to see how God answer's our prayers through this little guy's life! You look awesome! I wish you the best and hope everything goes smoothly! You look beautiful Faith! Lots of prayers for you and your sweet baby boy. You look so beautiful, Faith! 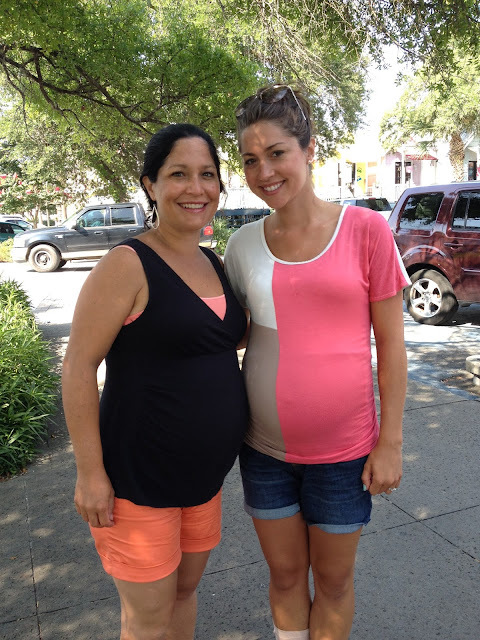 How fun that you and your sister are pregnant at the same time - and both with boys! God is so good! I love your bulletin board pics. That's so creative. One thing we've had fun with is letting our older kids design a month number to pose with the baby each month after he is born. Thank you! Aww that is a sweet idea!